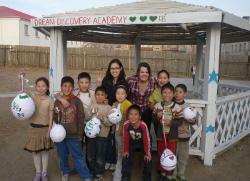 Anna spent 5 weeks in Mongolia with Projects Abroad teaching English. She has now set up a charity called The Dream Discovery Academy of Mongolia (DDA). In June 2011, DDA is planning to hold a camp in the Mongolian countryside to offer an escape for poor and orphaned children and young adults. Having set an ambitious target of raising £3,000 by the beginning of June, Anna is now taking part in various sponsored events. On 7th May 2001, the DDA ‘Sister Hike’ event will see a team of hikers in the UK walk 10 miles at the same time as a second group based in Mongolia. Anna is looking for anyone willing to sponsor the event or donate to the cause. Hiking enthusiasts are also welcome to lace up their boots and join the team on their trek over Faversham Marshes. Projects Abroad wishes Anna and DDA the best of luck!